nice job davincipop.....I especially like the right hand side of the pic. Woot! 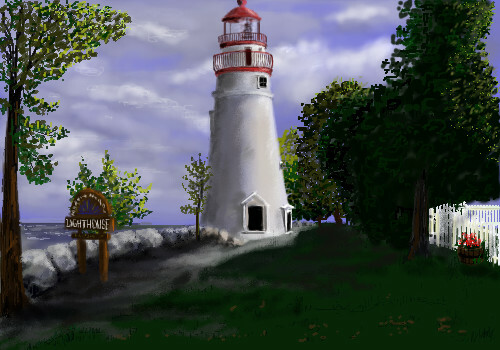 your great at drawing lighthouses! Heck your great at drawing! Cool pic! Oh this is so pretty... I especially like the shadows on the white picket fence on the right, and the tiny little railing at the top of the lighthouse. Great job on the perspective on that sign... that's hard to do. This is lovely. I really like the way you've shaded the tower. Nice to see one of your pieces. Great details, 'specially the trees. this is so beautiful poppa! wow...Tom and I were married at a lighthouse which makes it even more special to me! You did a super job on this! Details on the railing are quite nice. Shadows on the trees towards the ground is effective, but the edge of the picket fence stands out a little too much. Overall the lighthouse gives me a good feeling. Thanks...where on the fence? I can still get in there and fool with stuff. Glad you like it miss donnajeanlag! Beauteeful picture Poppa :) It really does look like you could walk right up to the lighthouse and take a look at the view over the lake. Super! Thanks for that link, darkshadow. There are lots of lighthouse pics there.. a nice one of Marblehead in winter, too. That's a nice one dark. Might do. So pretty, lighthouses are fun... Nice descriptive sign there, keke 'Lighthouse'. Once I got to go to the beach, and we had a lighthouse about a 2 mile walk from our little house thingy. Thanks Jana..hey...I didn't notice..this was my 200th pic! wooow!! 200th!!! congratulations!! i like this pic.. I've been there, I was three years old when I went to see that lighthouse. Don't remember much, but I do remember posing infront of that sign for a family picture. Thanks! Boy there's bunches of you in Ohio. Kraisa you must live pretty near emmamommalag.